The hills and valleys of what is now known as Daley Ranch were used for centuries by Native Americans of the Kumeyaay, Luiseno, and other small tribes. Evidence of their use of the area is difficult to see and many times well hidden from the designated trails and viewpoints. Metates, morteros, grinding slicks, and manos among other things have been found in excavation and habitation sites by trained professionals over the years that give evidence of life and food preparation by the Natives. The first recorded European settler to arrive in this valley was a young English immigrant named Robert Daley. He settled into this valley around 1869 and built a small cabin. After a federal survey of the land in 1875, Robert Daley’s claim to the land was reaffirmed and he was granted two official claims of 160 acres each. Over the years he constructed other dwellings, barns, and outbuildings as he expanded his holdings to around 3000 acres. The current ranch house was built in 1925 of single board, heart redwood. The main feature of the house is a cobblestone fireplace. Its composition is believed to be from rocks that were said to have been used as ballast of old sailing ships that came around Cape Horn and were dumped at Ballast Point when the ships docked there. The rocks were then used as street pavers in San Diego’s young city and the Daleys were contracted to remove them during their road building and paving through the Daley Construction Corporation. 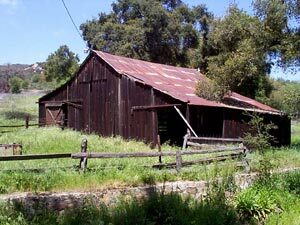 The ranch was used as a horse ranch, cattle ranch, then as a dairy/creamery with the goods hauled to San Diego for sale by wagon. After Robert Daley died in 1916, the remainder of the family moved to Jamul but leased out the dairy for many more years. When the lease was no longer profitable, they used the ranch mostly for summer vacations, family outings, and frequent fiestas for the community. They also built a small, spring fed swimming pool on the southern end of the house which was later removed. In 1996, developer plans for the land were halted when the Escondido City Council voted to purchase and forever protect the 3,058-acre ranch as a habitat preserve. For information on preserving California's historic heritage, please visit www.ohp.parks.ca.gov.